His request drove the development of a general management framework for their business based on approximately 30 of the company’s planning and analytic frameworks- from brand and channel marketing to human resources and capital planning to detailed process mapping. The resulting mental model for thinking about the business became the foundation for a rigorous business planning process and played a part in significantly increasing business growth after years of flat performance in those 40 regions of the client’s business. Since then I have taken a similar approach in several industries with comparable results. 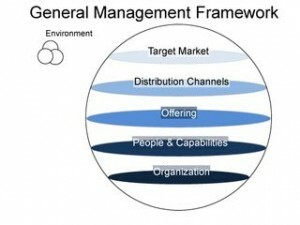 The general management framework can provide a point of departure for creating a unique mental model of your business and common language for your organization. 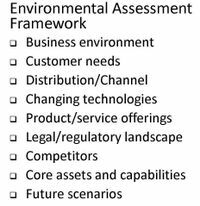 This general management framework is comprised of six elements each representing a critical mega-component of the enterprise. Target Market represents the ultimate consumer of your goods and products. Segmentation differentiates clusters within the market based on needs and preferences. Penetration, profitability and life-time value of the customer then become part of your target market analysis. Distribution Channels are how you “sell into” your target segments. The Internet has brought another distribution channel into play causing some companies to compete directly with their customers. Like target market analysis, companies must consider the efficiency and effectiveness of various distribution channels and individual entities within each channel. Particularly as you consider the preference cost of various entities. Offering is the combination of your products and services. Matching needs and preferences with profitable delivery of your bundle offering of goods and services requires full understanding of delivery costs, competitive pricing and promotions, distribution costs, and relative importance of features and benefits to the customer. People and Capabilities represents most of your business’ assets. We highlight people because of their importance and ability to off-set for example, limited discipline of process definition, non-supportive systems, vague strategies, and unclear business models. Other capabilities include processes, technology and physical infrastructure, brand, industry relationships, patents, intellectual property and many, many others. This area of people and capabilities is where most businesses focus to the exclusion of consideration and alignment of the other five elements of the enterprise. Organization quite simply defines the structure, roles and scope of the departments, divisions, functions that make up your business. Typically, managers try reorganization to drive change because it is visible and concrete, only to find that they face the same problems because they have not considered the implications of the other elements of the framework. With a number of clients a simple discussion, starting with the target client, serviced through which channels, to provide which offering, created by whom, supported by which capabilities, and organized how… is a great start to thinking about the business.